One of the favorite scams of climate alarmists is to blame an eroding sandbar in Alaska on your SUV. 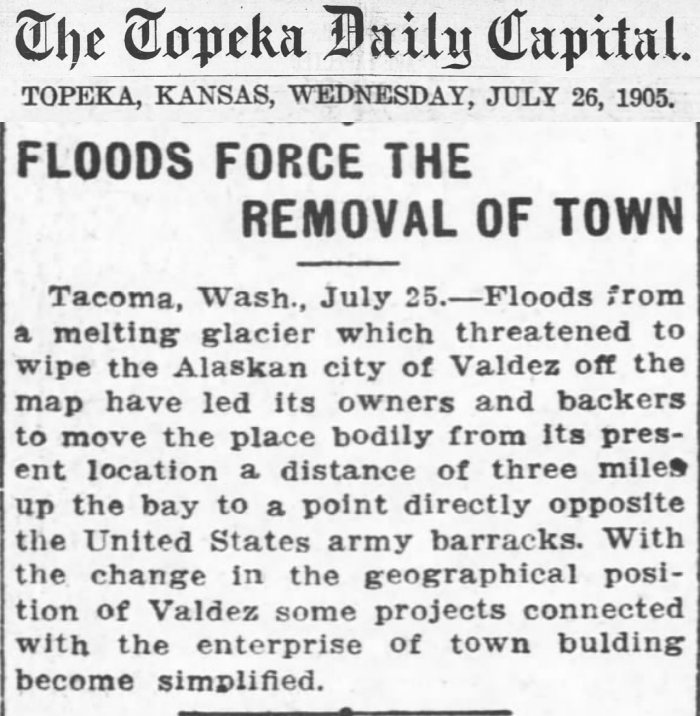 In 1905, which was one of NASA’s coldest years on record – the entire city of Valdez, Alaska was relocated due to melting glaciers. Climate alarmism is 97% dependent on extreme ignorance and stupidity. Plus 30% greed for money/executive power & 20% inability to understand how statistics work. The numbers don’t add up. You are still missing 53% somewhere. A Progressive Boulder carbonist told me about 10 years ago he was 200% certain that the facts in the Al Gore flick are the truth. That must be the “97% of the world’s scientists” that Obama and his lackeys keep referring to. What was the temperature in Valdez that year? I absolutely deny my bicycle is responsible for Baked Alaska.